Silversark put together an amazing fashion show on Friday to showcase pieces she made inspired by church architecture and her trip to the Netherlands. This is something I cooked up for a background piece for the show. The design work took several months and the actual creation of the piece took about a week, working 12-16 hours a day. 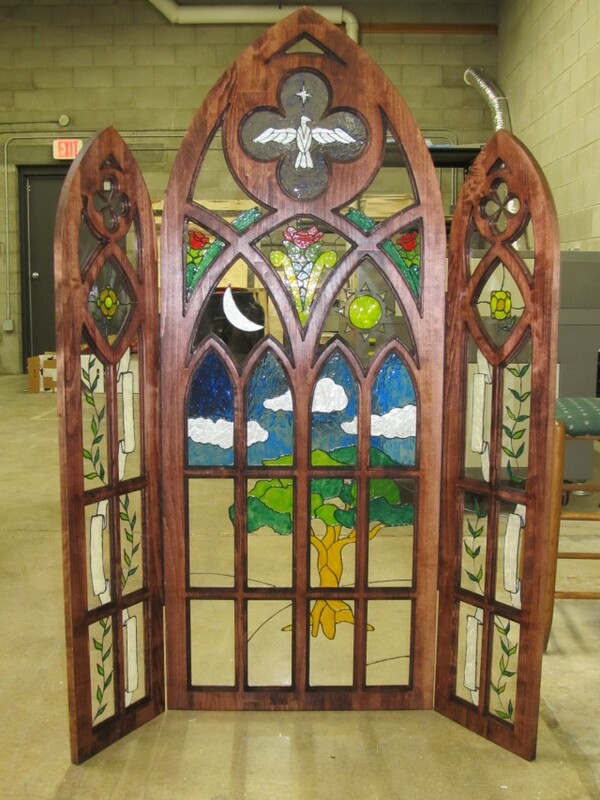 The frame is made from CNC routed aspen (thanks, Jason H.!) which is a rather “fuzzy” wood and required two days to hand finish, including the use of a set of needles files to smooth out the inset edges. The acrylic panels were hand-stained with Gallery Glass stain and simulated liquid leading. They’re not quite finished yet, but I plan to complete the staining within the next week. I’ll also be using this as a backdrop for various events including the Sustainability Summit coming up as well as the Concinnity sci-fi/gaming convention on April 5th. Additionally, this might be making its way to Embellishments in the Grand Avenue Mall for a window decoration. I can’t wait to make another one!